In mid-August, the Federal Environment Agency rejoiced that electricity generation from renewable energies had achieved a record half-year. At 117 billion kilowatt hours, the half-yearly figure was around 10 percent above the previous year’s level. 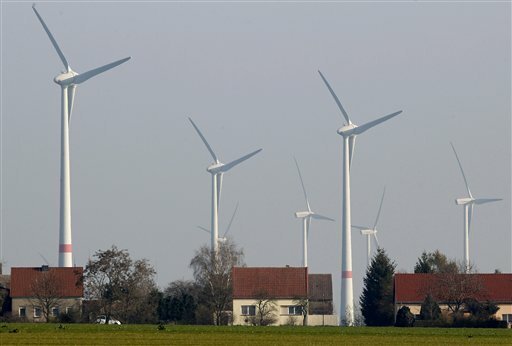 Economics Minister Peter Altmaier (CDU), however, was pleased that the share of renewable energies in electricity consumption had meanwhile risen to 35 percent. So these are the best conditions for a rapid phase-out of coal-fired power generation? This summer’s data shows a different truth. 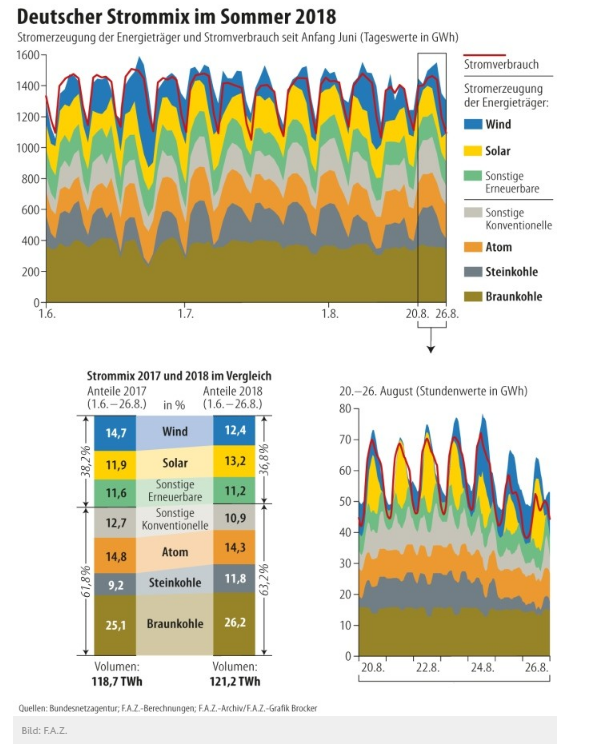 Although more wind turbines and solar plants were installed than in the previous year, the amount of green electricity generated fell. Lignite and, above all, coal-fired power plants had to step in to meet the demand for electricity. The data from the Federal Network Agency for Power Generation shown in the following chart show that, to the great delight of their operators, coal-fired power plants have so far supplied almost 10 percent more electricity than in the same period last year, despite rising prices. The dry summer may have caused the feed-in of photovoltaic systems to skyrocket. However, the lull associated with the stable high pressure situation rarely caused the wind power plants to start rotating and if so, even far below their capacity. The Federal Environment Agency had to admit that the good yield of the first half of the year had lived mainly from the stormy January. This alone accounted for 70 percent of the growth in all renewables registered up to June. These summer weeks were also the time when environmental politicians, groups and renewable energy lobby groups increasingly called for the accelerated expansion of (subsidised) wind and solar power plants on the one hand, and for an accelerated phase-out of the demonstrably climate-damaging power generation from coal on the other. Against this background, the Commission “Growth, Structural Change and Employment” appointed by the Federal Government is again considering this Thursday how quickly the planned phase-out of coal-fired power generation can be achieved by 2050 at the latest. There are likely to be fierce debates, if not disputes, this time after “Climate and Coal”, the topics of security of supply and price are on the agenda. And the fight for the forest on the edge of RWE’s lignite open-cast mine in Hambach, which is now being fought again with stones and metal poles against police officers, will fuel the mood. While on Monday members of the commission expressed their solidarity with tree occupiers and demanded the renewed postponement of the upcoming clearing of 100 hectares of forest, the members of the trade union IG BCE are vociferously opposing this in front of the Berlin conference venue. According to RWE, logging is necessary so that the opencast mine can supply power plants such as Niederaussem. The work had already been abandoned last winter. But now RWE wants to use the time until February in which logging work is permitted. Because without constant supply, power plants would soon come to a standstill. Not only RWE wants to prevent such a cold turkey shutdown, but also the state government, which has energy-intensive industries in mind alongside lignite. “Security of supply is a decisive factor in the competition between European business locations and must not be put at risk for political reasons,” said Minister of Economic Affairs Andreas Pinkwart to the F.A.Z. He recalls “critical phases” such as at the beginning of last year, “in which the German power plant fleet was at its limit due to the weather”. For this reason, the country cannot make its security of supply “dependent on other countries”. With this statement, Commissioner Pinkwart is putting his fingers on a sore spot. Because in the concepts of the German government, which it also wants to support this Thursday with probability calculations, foreign countries play an important role for domestic supply security – after the last nuclear power plant comes to a standstill at the end of 2022 and more and more coal-fired power plants are to be shut down. Pinkwart is not alone with his admonishing words. The electricity network operator association Entso-E, which is also invited to the meeting, has issued its own invoices. Highly industrialized Germany would therefore have to expect a few dozen hours of power outages per year in the 1920s. Today the rate is a few minutes. 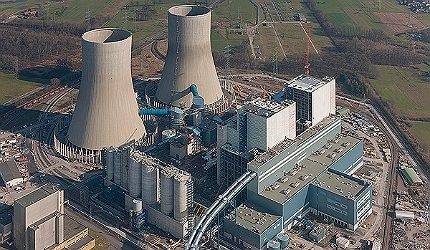 Coal-fired power: saving Germans from a return to the Stone Age. Yep. Once again, Germany has won the race to the bottom in Europe. Some other places were in that race, like Australia, Canada, California, New York State, Northampton, Mass., Great Barrington, Mass., (and other wind and solar power wannabes), etc. Don’t worry, there’s lots of booby prizes to go around. How did Merkel say: we can do it. or, as others say, we get rid of ourselves.